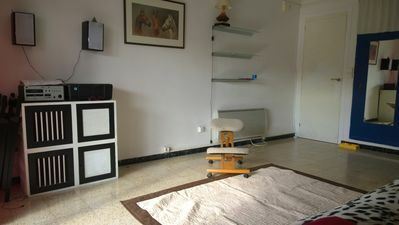 Apartment in Torredembarra, 400m from the beach, your pet is welcome! Apartment quiet and very well located with what you need to enjoy a few days of beach. It has a double room and is ideal for singles or couples. There is also a futon sofa bed, useful for a third or fourth person on short stays. Torredembarra is a town full of life with varied parties and celebrations and a huge beach of fine sand. If you like hiking, you will find very good opportunities on the path of the cliffs to the castle of Tamarit, to the south or in the wetlands of Creixell, walking north. It is also the perfect place to visit the wonderful Costa Dorada. You can walk to the train station in 5 minutes and from there to the millenarian Tarragona, the route Gaudí de Reus or the fun of Port Aventura and Salou. The kitchen has electric plate, microwave, kettle and coffee machine Nescafé Dolce Gusto for which you can buy the cartridges in the nearby supermarkets (carrefour, Dia, Caprabo ...) and filtered water of Osmosis. Please note that there is no conventional oven. The balcony is the best area of ​​the house, where you want to be during the day because it is super sunny.